Want to see what a 21st Century Internet-based, people-powered mass revolution looks like? 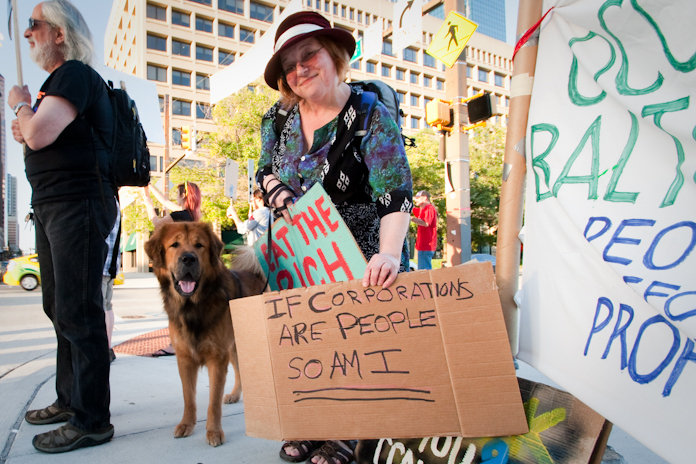 Sign on to Twitter and follow @OccupyWallSt @OccupyBaltimore @OccupyPhilly @Occupy[insertanycityhere] @Occupy_USA @BankTransferDay @YourAnonNews. Follow the breadcrumbs to Facebook pages and Meet Up events, blogs, mainstream articles, and Google groups. Go to YouTube, search “occupy.” Go downtown and see the protests happening in your own city. Meg Rorison, MICA student in Baltimore, says “I am sick of complacency.” The sentiment is utterly resounding. It’s occupying everywhere. Endless tweets, Facebook updates, event requests and emails branded with #ows #occupywallst #occupybaltimore #occupyeverywhere and #revolution have become a driving presence in daily Internet consumption for many of us. Even folks paying attention to mainstream media are hearing all about it. Just this week, Occupy Baltimore was on the cover of Baltimore Sun and the cover of The City Paper. You’ll even see it on the 10 O’Clock News, if you do that kind of thing. Occupy protests have emerged and continue to grow across the country in various cities, “This is grass roots and growing fast,” remarked Chris Lyman of Occupy Baltimore. As of Oct 12, there was 1,430 cities involved in the Occupy Movement. The rapid exponential growth of the movement would not be achievable without the use of the Internet. The movement dominates our networks, packaging and delivering messages of discontentment and resentment towards a corrupt system. In the same way protestors’ signs challenge the passerby’s worldview, I see hundreds, maybe thousands, of signs each day, at my computer, taking the form of tweets, photos, updates, emails. Back in June 2011 at a conference in New York, I was fortunate enough to sit in the same room with several revolutionaries and hear their first-hand accounts of the overthrow of the Egyptian government and resignation of dictator Mubarak. Of many speakers who left a lasting impression, Alaa bad el Fattah and Dr. Rasha Abdullah took the cake. It’s easy to draw parallels between the Arab Spring and the Occupy Movement, but it’s important to note the differences. First, the Egyptian uprising that began on January 25, 2011 did not start in 2011. “This revolution started years ago,” Dr. Rasha Abdullah reminded the crowd. For decades, the people had a “single dream of revolution that was directly taught to us by our parents,” explained Alaa Abd Al Fattah. According to Alaa, many of these revolutionaries had been activists for ten years or more. Alaa‘s mother protested in Egypt in 1972, when they were very close to a nationwide uprising, and again during the actual uprising of 1977, the Bread Riots, “which lasted for three days, the State crumbled, the police were hiding, and it still didn’t last.” Activism was a way of life for many families, and revolution was never far from their minds. They had decades of experience as activists and, in that moment, they had one clear goal. And it worked. Like the 99%, the people of Egypt used the Internet. Dr. Rasha Abdullah talked about the power of a Facebook Event where anyone could “attend the revolution” and how the page drew millions of people to Tahrir Square and to squares across the country. With the Arab Spring ongoing in different parts of the world, I wonder if the Occupy Movement is subconsciously (or consciously) uniting with the Arabic Rebellions in a large scale global uprising. The Internet is only a reflection of humanity and, right now, humanity is searching for something better than its current circumstance. You can hear the outcry on every network, in every online newspaper, on every mobile phone, in countries all over the world. The Internet is reflecting our dissatisfaction with corrupt politics, economic inequality and corporate greed and it is providing a way to coordinate (inter)national movements that spread to thousands of distinct locations around the globe. Amid the passion, the people and the protests, let us not forget to protect one of our most powerful tools. It’s said that we have nothing to lose. Are we sure about that? The fact that access to the Internet is not considered a basic human right in this country is downright disturbing. At any moment, if it becomes too threatening, it could be gone. It happened in Egypt (Jan 28, 2011). Internet censorship, “or control or suppression of the publishing of or access to information on the Internet,” is one of the biggest threats to this movement and to the earning potential of millions of people. Access to the Internet as a basic human right for every human being is certain to be a major social justice issue in the 21st Century. 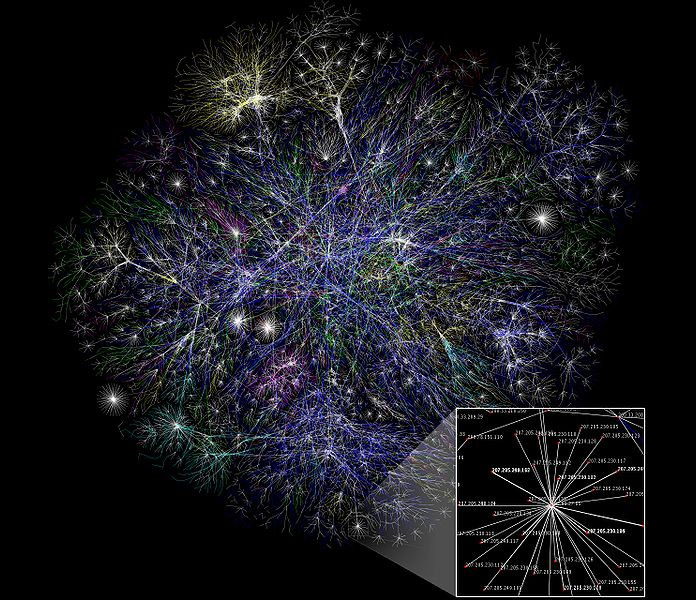 More than a tool for social change, the Internet is also the means by which many of the 99% make their living. We had to adapt when the manufacturing industry moved overseas. Manufacturing is credited by experts to have created and sustained the middle class in this country for a century. Now a portion of the “middle class” sustains their livelihood by building web-based companies or freelancing, creating and selling digital technologies and non-tangible products such as apps, websites, games and online media. [Suggested reading.] Given our reliance on the web, I wouldn’t want to imagine a world where the 1% controls access to the Internet. This mass-production-via-mass-media proved to be an efficient way to influence the masses to covet things they don’t need and often can’t afford. Only recently have the people started to wake up from this lie. 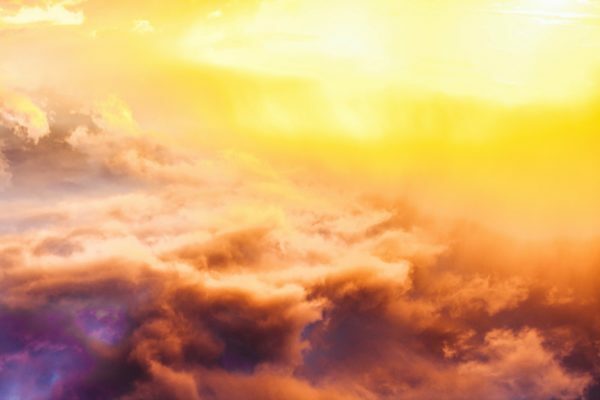 The fog of mainstream media manipulation is starting to lift thanks to the Internet and many of us are starting to see the world more clearly. Buying plastic junk does not make us happy. Working meaningless jobs does not make us happy. And the repercussions to our consumer society have been devastating. “I think what we are seeing is sort of the first steps towards rebellion here in the U.S. 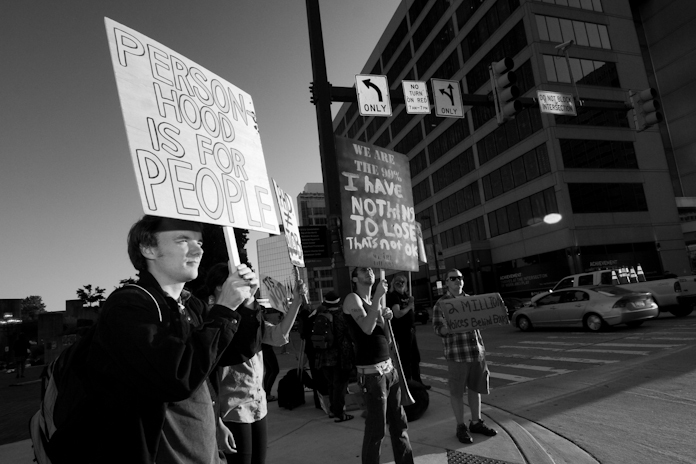 Many people who have been fed up with the conditions of society and the economy over the past several years are becoming increasingly frustrated with the system of electoral democracy because they see it for what it is: a structure that gives the illusion of democracy,” observes Baltimore Occupier Andrew Castro. Meg Rorison, from Baltimore, explains: “I am currently a grad student at MICA, who will have to pay back thousands of dollars in loans. I am worried about finding a job, I am worried about my future. …. I’ve come to realize that there is a growing consensus that THINGS NEED TO CHANGE. Though modern digital tools are being used to accelerate the Occupy Movement, there’s seems to be a hankering for a distant past, before the TV-Industrial Complex, when communities were stronger and things were simpler, food was local and work was meaningful. Maybe the solution looks more like a village or tribe than more systems, more money or more jobs. Maybe jobs look different than they used to. Maybe that’s something we’ll have to get used to. Maybe we can’t earn as much money. Maybe we don’t need as much money. So we’ll grow our own food and find ways to exist happily without money. We will be rich in other ways. Maybe we’ll have to share cars. Maybe we don’t have cars at all. Maybe we can’t be privileged forever. Maybe the solution is working towards a hyper-local resource economy. Maybe it’s time to consider starting over. 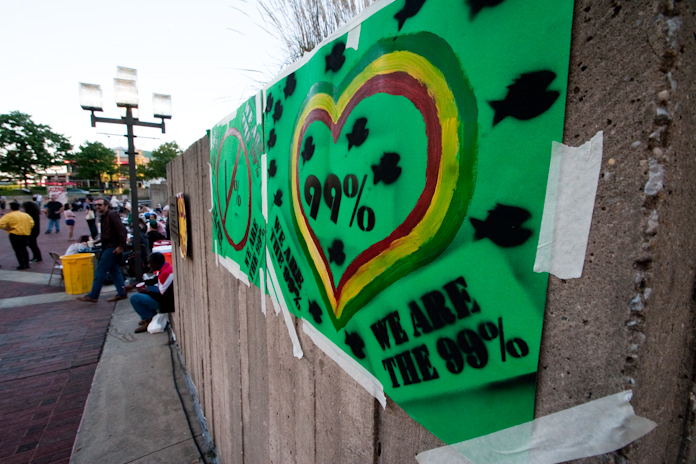 As far as Occupy Wall Street goes, Baltimore has successfully risen to the occasion. Protesters are gathered at McKeldin Fountain located on the corner of Pratt Street and Light Street in Downtown Baltimore right now. Find out more… occupybmore.org. Bank Transfer Day is so obvious –it amazes me that I couldn’t see it before. It’s non-violent, proactive and it will have a huge impact if a reasonable number of people participate. Christopher Lyman discusses how the Occupy Wall Street movement came to Baltimore and why it is relevant to the issues of the city. 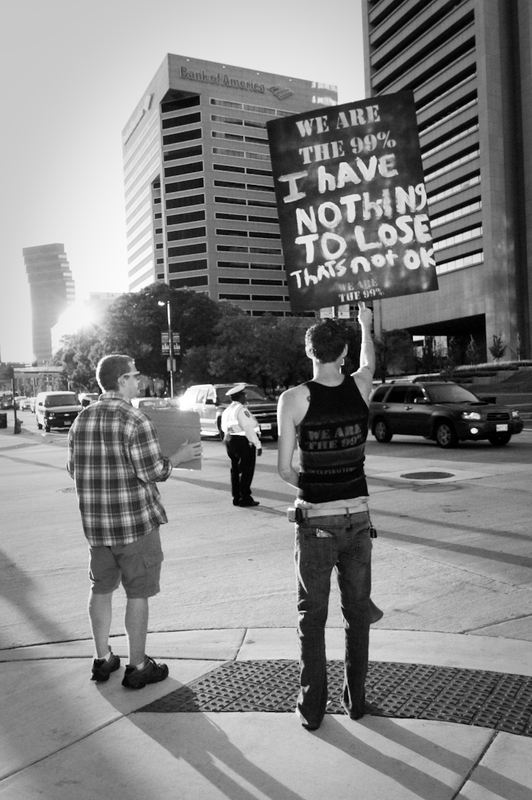 The Occupy Wall Street movement has spread to Baltimore, Md. 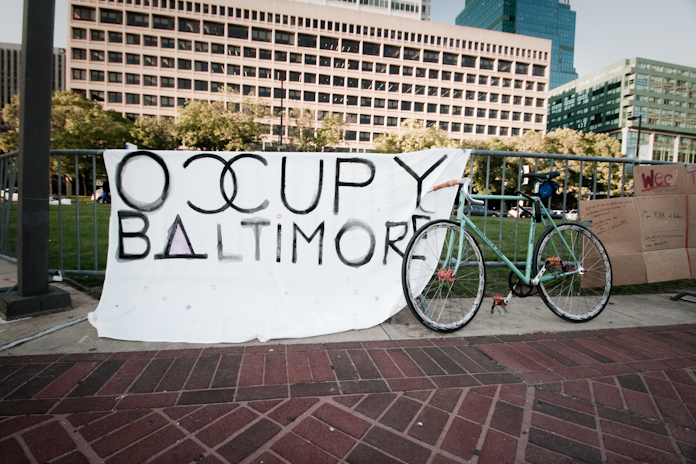 Occupy Baltimore is located at McKeldin Square at Baltimore’s Inner Harbor. 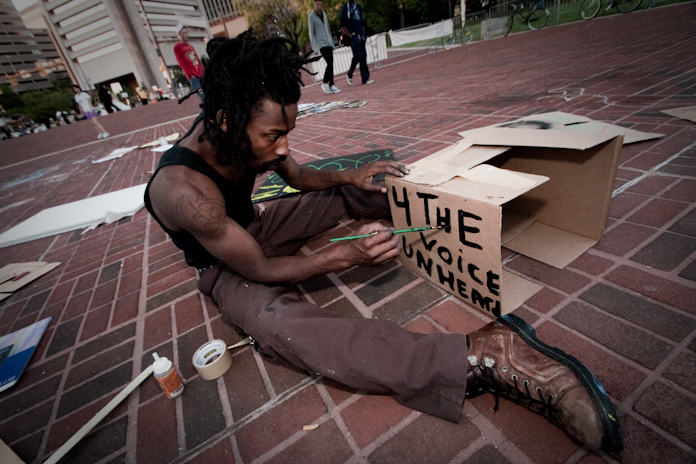 The ‘Voices from Occupy Baltimore’ series highlights hopes, concerns, and issues of people from the growing movement. Go to www.occupybmore.org to get involved.